Offering you a complete choice of products which include gutter & downpipes. Backed by a team of dexterous professionals, we are engaged in manufacturing and supplying a wide range of Gutter & Downpipes. These products are manufactured by using top notch quality material and cutting-edge machines in order to meet the increasing demands of our precious customers. Possessing salient attributes such as superior quality and uniform thickness, makes these products are widely demanded among our clients all over the country. 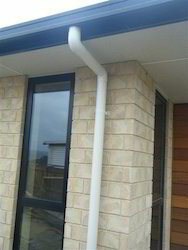 Looking for Gutter & Downpipes ?